I cannot get the Hoary Bat out of my head. I never knew, until my ill-fated encounter, that these are among the most birdie of the North American flying mammals. Hoary Bats roost in trees, not caves. They are solitary, and their roosting habits may be the reason for their frosted fur and (relatively, for a bat) high-contrast patterns of coloration – in the open, with no safety to be had in numbers, they need to blend with lichen and break up their outlines to avoid predation during the day. Trees get pretty cold in the winter, especially when you’re all by your lonesome with no one to cuddle. So the Hoary Bat is migratory. The species ranges north well into Canada in the summer months, but in the winter they make for the southern coasts or down to Mexico. They may gather in flocks of hundreds during their fall journey, abandoning their lonely summer habits. Spring migration is more sedate, and opposite of most songbirds the females travel first, already pregnant, to stake out their summer territories. Migration makes them vulnerable to straying: Accidental Hoary Bats have been found as far afield as Bermuda and Iceland. 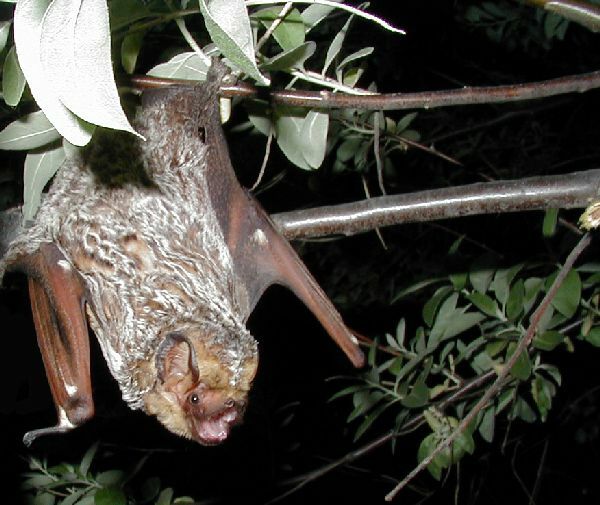 It also makes them more vulnerable to other things — migratory tree bats, such as the Hoary and its cousin the Red Bat, make up some three quarters of bat fatalities at wind turbines, and these fatalities cluster in late summer and early autumn. On the other hand, eschewing caves and cold weather is protective against the devestating White Nose Syndrome, a fungal disease that strikes hibernating colonies and drives bats like the Little Brown Myotis out into the cold to die. Mobility and flexibility also grant the Hoary Bat a continent-wide range and relatively solid conservation status – although the Hawaiian subspecies, like so many wonderful things Hawaiian, is endangered. Indeed, they are so common that it’s surprising that they’re not better known. But as the Peterson Guide says, they fly late, solitary. Photo courtesy of the USGS. P.S. Back to actual birds next week! I feel compelled to do a Hoary Bat post of my own now…. I am not entirely convinced I should quit birding and search for vagrant Hoary Bats in Germany. Where Are You Birding This Third Weekend of August 2012? The Collaborative List 2017 – January.